A Little Good News was written by Charles Black, Rory Bourke, and Thomas Rocco. The song was recorded by Anne Murray in Toronto, Canada, and released in 1983 from the album of the same name. Beginners: If you don't play along with the video, you don't need to implement the key change making it a great practice song with easy chords... when reading the song chart, just pretend the sharps aren't there. And ev'-ry bo-dy loves ev'-ry-bo-dy in the good old U.S.A.
PS. You can also play F# as a barre chord using the E shape with the barre on the 2nd fret. This works well in the choruses when playing from F# to G# (same shape). simply use your 3rd finger to cover strings 5 & 6 to include the bass note. Same applies to F#. Born: Morna Anne Murray on June 20, 1945 in Springhill, Nova Scotia, Canada. Won 'Album Of The Year' at the 1984 Country Music Association Awards with her 1983 gold album, A Little Good News (pictured). Sheet Music at Musicnotes.com - Piano/Vocal/Guitar - 5 pages - Digital Print - C Major. Anne Murray chords and lyrics are property and copyright of their owners. 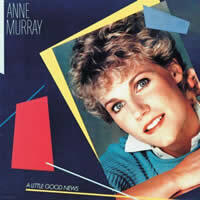 "A Little Good News" chords and lyrics are provided for educational purposes and personal use only.